Enjoying more sunshine than anywhere else in the UK, a wonderful seafront location, and easy access to spectacular and invigorating countryside, Eastbourne offers huge appeal to a broad range of visitors and residents. Such a diverse spectrum of visitors will also demand a similarly wide range of places to stay in Eastbourne so how do you make the right choice? 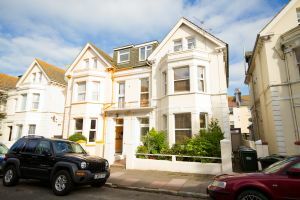 There are many hotels, guest houses and B&Bs in Eastbourne, and a wealth of excellent restaurants, so why should you opt for self catering accommodation? Having a holiday apartment, cottage or home means you have the flexibility to prepare food whenever you want to. It also gives you much more space and freedom than the average B&B or hotel. Want to get away together with a big group of friends, extended family or perhaps business colleagues are working on a large project in East Sussex? 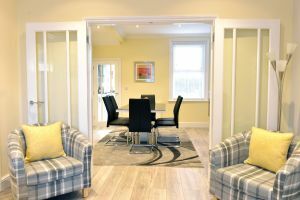 We have large properties which sleep up to 19 people, such as Number 95, which has 8 bedrooms, 3 reception rooms and a private enclosed garden and sleeps up to 14 in permanent beds (with an additional 5 put-up beds available). It is just a few minutes walk from the iconic Victorian pier, beach and town centre. Looking out onto water can feel like instant therapy – the perfect solution to the stresses of modern, urban lives. We have beach-front and waterside properties such as Beach Garden sleeping up to 6 people in a prime spot on Pevensey Bay or Wellington Quay, the ultimate property for a holiday home in Sovereign Harbour, which sleeps up to 12 in style. From 1-bedroom apartments through to large family-friendly houses, we can offer advice on places to stay in Eastbourne for an escape. Ahh, why not completely escape the city (and avoid people generally) in favour of sheep, greenery and big skies. We have properties right on the South Downs way such as Friston Down Cottage, with a swimming pool and views to die for, sleeping up to 6 in three large bedrooms. Again with sensational views and a luxury finish you could try Little Friston Lodge, for up to 4 people in 2 bedrooms, with a roaring log fire for year round adventures. How about hunkering down in a 250 year-old cottage with the occasional leg-stretching stroll to a country pub? South Downs Holiday Cottage offers a quintessential country escape – full of charm and atmosphere yet with all mod cons and toasty warm throughout the year. Finding high-quality, but dog friendly holiday cottages in Eastbourne and East Sussex shouldn’t be difficult but you can waste a lot of time searching. We are delighted to offer a ‘dog friendly Eastbourne’ with a great selection of properties, all with gardens or access to wonderful walks on the beach, along spectacular cliffs or in nearby woodland and parks. Try Madeira Quay in Sovereign Harbour or perhaps St Mary’s Cottage in historic Old Town Eastbourne. Why leave your four-legged friend at home to miss all the fun? Based in Eastbourne we can provide comprehensive local knowledge to ensure you have the right property in the best location for your needs and support them with an un-rivalled level of service, including face-to-face check-ins and availability seven days a week. All our properties are fully furnished and equipped, including towels and linen, and include utility bills and WiFi. We are here to help so contact us now on info@exclusivelyeastbourne.co.uk, call us on+44 (0)1323 40 60 90 or give our Live Chat feature a go. 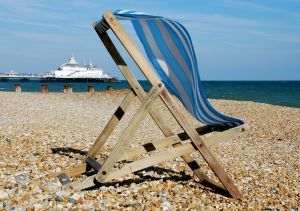 With so many places to stay in Eastbourne we are confident we can find you the right property.